The email came estimately 2 weeks back. It sat on my mailbox, mocking my pride. “Take a picture in your pajamas” the content spoke. I ignored it. Another email came again 3 days ago. A humble reminder to submit a blog entry for a ticket to Nuffnang 1st Birthday bash party. “If you are shy, it not compulsory to come in your pajamas” the statement teased me but yet for an entry, a picture in your pajamas with a packet of Chipster is still a must. I hesitated for 2 days. What bothered me ? Well, I have been for several months started a peculiar habit. I sleep naked. I can’t possibly take a snapshot of my flesh with a packet of Chipster. Attempted I did, nevertheless. 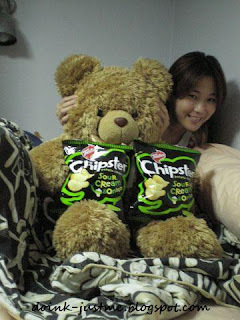 How wrong it sounded – I sleep better with Chipster. Even wearing the most decent pajamas I could dig from my wardrobe, still, I couldn’t bring myself to take a picture in it. What I wear to sleep is for the eyes with my intimate special someone. An art I take pride in with my selections of lingeries. If I do get a ticket for Nuffnang 1st Birthday bash party, despite the late entry, I need to shop for a decent pajamas. We are not the same persons this year as last; nor are those we love. It must have been at least 20 years ago, my parents last walked into TGIF. In fact, it could be my mother’s 2nd visit after the first one, the time I celebrated my birthday. It was a luxury to dine in TGIF, not exactly a fine dining restaurant but growing up in an average earning income family, this was the closest father could afford then. Now, all grown up, I walked in my own high heels, clutching my father’s hand, I noticed how hard his palm has become. The solid flesh revealed a life that endured the years. Step by step with his walking eye, the cane tapped from left to right. The hand that rocks the cradle held my beloveds hand on the right. Unspoken moments, my mother countenance radiated love. As the door flung opened at the entrance, mother’s eyes sparkled with a girlish twinkle, I knew that she remembered that special year with my elder brothers. Glancing at the beautifully set table, the three of us were seated comfortably. I took out the proud winning voucher and set it on the table. Mother looked at the photos on the menu and she gulped at the pricing. I assured her it’s free since we have the RM100 voucher. The truth was, RM100 is not enough but I hid the truth from them. We ordered our delights. Appetizer came. 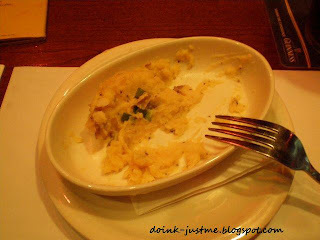 The mash potatoes finished within seconds. The lamb and steak came enormous, juicy and appetizing. 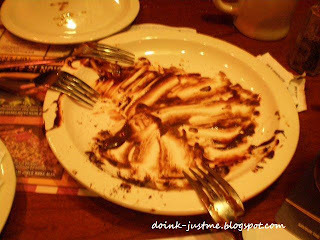 Gnawed with hunger, we gobbled down our food so fast I didn’t have time to take a decent photo. 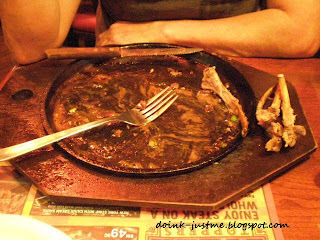 Mother literally licked the hot plate cleaned. When desert came, I was creeping with joy. Feverishly, mother and I swallowed the candy plate like little kids. Selfishly, we gave father only a bite for taste and forbid him anymore of the goodies. Chocolate and ice-cream aren’t a diabetic person’s best friend. 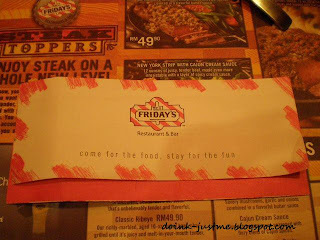 We left TGIF with a full stomach and a flashback of the good old days. 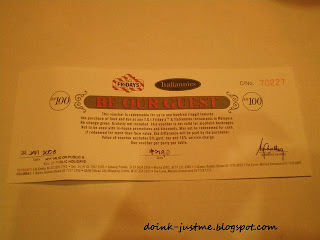 NOTE: Many thanks to Esther (previously from Nuffnang) for posting me the TGIF vouchers. Thank you TGIF and Nuffnang for the free meal. Do you know yourself well enough ? I came up with this list of questionnaire with the intention of posting it up in Facebook but I never got my arse in completing the task. Procrastination is in my blood. I blame my bad genes. Anyhow, here’s the list. See if you can answer it within 2 seconds for each statement. Which do you prefer? Some people just have no level of tolerance and understanding. With the short span of 2 months this year, I am alarmed to discover the social illness of the society today. Captioned in 4 parts, here’s story Part 1. I walked in hastily. The line wasn’t long at all as I expected it to be. For it is the festive season and everyone has a burning need to relief themselves after a long drive on the road. Surprisingly, the room with 5 cubicles weren’t emitting any foul pungent. Years ago, the cemented flooring will be wet and one would need to cover their mouth or the person will die intoxicated in contaminated air. So, Malaysians have learnt to keep the public toilet humane enough to walk in. I was second in the queue and truth be told, it was an imperative joy to walk into a public toilet with a short line. Clutching my thighs tightly, I was in dying need to go. The woman came out in 2 seconds and she handed the small pail to the lady in line. The lady with gleaming white straight teeth, black eyes, shiny jet-black disheveled hair and a shapely mouth ran to the washing basin to collect water. I watched her in disbelief. Next to the cubicle was another skinny boned woman. She stood next to a big bucket. Held on her hand was a water hose. She was collecting water and apparently there’s no water in all the cubicles. One look at her, one could sense her unfriendly posture as her eyes shy away from any human contact. It was as if she has shut herself from the mortal world. Coldness was written all over her face. I tried to catch a glimpse with her. Nothing I did intrigue her to return a smile. Not even my super scissor leg stance. She wasn’t impressed at all. Suddenly, out of no where I heard myself said “Kak, boleh pinjam hose ?” (Sister, may I borrow your hose?) She exploded with a stern, “No”. I went blank. Why? What has she got to lose by improvising 1 minute of her time for the convenience of others? I looked at her, speechless, trying to strike my vocal chords to vibrate once more, I could only dumbfoundedly come out with a “Why not?” She shook her head coldly. Why do such people exist ? Makes you wonder why.